Are the attacks in the middle east crippling bi-lingualism? After reading report after report of the attacks on American embassies, American schools, and Americans in the middle east. I started to wonder, are the ultra-conservative on this great nation warranted in their Xenophobia? Considering the almost 3,000 dead in the September 11 attacks, the recent attacks on American entities abroad and when you combine that with the fact that all these attacks were perpetrated by “outsiders”. Can a logical person start to see the reason that some are so afraid of things such as other outside culture, outside languages and outside people coming into our country? While some discussions are outside my pay-grade, I’d like to start the discussion around language and languages. A large number of countries that support multilingualism and their residents see the benefits of that. Our neighbor to the north, Canada is one of those countries where bilingualism is valued. People all around the world embrace multilingualism. These countries have seen that one does not replace the others. Because you focus on Spanish in the child’s youth does not mean that they will miss out or get behind in their native language. My own son is testament to this. He is four and he fluently speaks both English and Spanish. He actually has a great appreciation for languages. He loves to catch people making mistakes, and has soon as he does he pounces! It’s pretty comical really, but I attribute it to the fact that he works to improve his language and he doesn’t see why others should be any different. He corrects his family, he corrects neighbors, and he corrects teachers whether they’re speaking English OR Spanish. While I work with him to tone it down a bit, I don’t discourage his affinity for language, on the contrary I encourage it. He’s always loved reading, he’s always had a special connection with books and I work hard to see that he does not lose that as he gets older. Most of us have lost that passion that we had when we were his age. I work hard to maintain it if not just for myself, but him as well. Well, the same that can be said about language can be said multilingualism. I realize that his love for language comes from his ability to view language as a tool to communicate. When you’re swinging a hammer you want to know how to do that correctly so that you don’t miss the nail and so that you finish the job quickly and correctly. Language to my four year old son is exactly the same. He wants to communicate with his peers in the most effective means possible and oftentimes that means communicating in Spanish and doing so effectively. Does that take away from his English? Absolutuly not! He is very eloquent (for a 4 year old) and has a great vocabulary in both languages. That is because the brain is just like a muscle the more you work it out the stronger it gets. 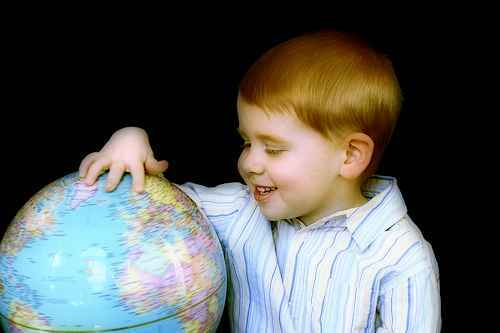 In my sons case, starting the excercise at a young age has lead him to where he is now, he loves languages. Because of this one should not be afraid of other languages, but embrace them and feel comfort in knowing that proficiency in more languages helps the vocabulary in each language become stronger. I do not agree with this post..I don't believe that Spanish is being affected, everyday I hear of more parents who want to teach their child spanish.